Hototogisu (不如帰, Hototogisu?) is a war simulation game developed by Tamtex for the Famicom, and published by Irem in 1988. The gam eis set in the warring states era of feudal Japan, also known as the Sengoku period, the same historical period in which many other Japanese war simulation games, such as Koei's Nobunaga's Ambition, are set. The game is named for a bird native to Japan, the Lesser Cuckoo. The goal is to balance one's duties as a daimyo (feudal lord) with expanding and increasing one's territories through warfare and diplomacy. 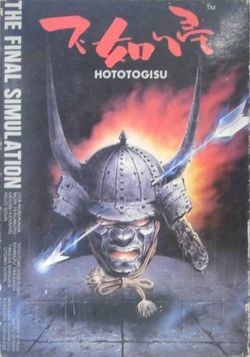 Hototogisu would be followed up many years later in 2008 with Sengoku Efuda Yuugi: Hototogisu Ran for the PSP. It uses the basic structure of its Famicom forebear but also introduces a collectible card game element to the strategy as well. This page was last edited on 29 June 2014, at 00:37.